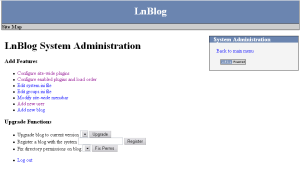 In this installment of the LnBlog walk-through, we'll be taking a look at the administration page and creating a new weblog. This will get you to the point of having a working, if empty, weblog. 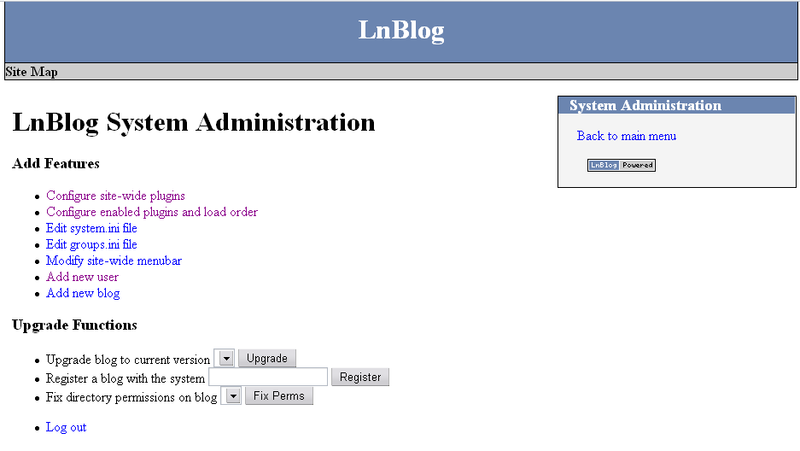 When you access the main LnBlog URL again after your initial setup, you will be asked to log in and then taken to the administration page. This is where you will create new users, new blogs, and perform upgrade and administration functions. Let's briefly go through the links you'll find on this page. In the "Add Features" section, the "configure site-wide plugins" link allows you to control the default plugin settings for your blogs. Plugins can be set up on a per-blog basis, so if you don't specifically change the plugin settings for a certain blog, the ones set here will be in effect. I'll cover plugin configuration in detail in a future installment. The next link, "configure enabled plugins and load order" allows you to disable installed plugins and to change the order in which they are loaded. The defaults will probably be fine for a new installation, but if you want to, for example, put the blog sidebar panels in a different order, the easiest way to do it is by chaning the plugin load order. As with the plugin settings, loaded plugins are configurable on a per-blog basis. The "edit system.ini file" and "edit group.ini file" links will simply let you edit the indicated files in a text area. Currently (as of version 0.8.0), the only reason to edit group.ini is to make other users administrators. The system.ini file, on the other hand, does have a few setting that you might be interested in. I'll save that for another day, though. Right now, we're still on the basics. The "modify site-wide menubar" link is used to add custom links to the site map bar under the page banner. Note that this is also configurable on a per-blog basis, so use this link to create the default site map. Note that the site map is controled by the SiteMap plugin, which has several configuration options. If you do not change the settings, then the default behavior is to dynamically add a link in the sitemap to each blog you create, so you really only need this to add links to sections not managed by LnBlog. The "add new user" link should be pretty self-explanatory. It just lets you create new users, just like you did in the last installment. The only difference is that any new users you create will not be administrators. That brings us to the "add new blog" link. If you click that, you will be taken to the new blog screen. 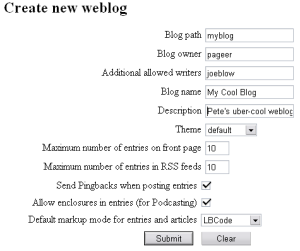 Here you will enter the options for your first blog. The first piece of information you need is the blog path. This is the root-relative URL of the blog and the path to the folder it will be created in. For example, if you give "myblog" as the blog path, then LnBlog will store this blog in a folder called "myblog" under the document root on your web server. The resulting URL of your blog would be http://yourhost.com/myblog/. Note that you can specify paths in this box as well, provided the beginning components of the path already exist. For example, you could give blogs/tech/linux as the path, so long as you already have a /blogs/tech/ on your server. The blog owner is the username of whoever "owns" this blog. The blog owner is considered the administrator of this blog and can change any of the blog's settings. Note that site administrators, like your first user account, can also change any settings on any blog. The "additional allowed writers" box lets you list specify a list of other usernames who can post new entries to this blog. You should separate the usernames by commas with no spaces. Note that these users will not be able to change any blog settings (unless they are also administrators). The blog name and description boxes are pretty obvious - they're the name and description for your blog. These will be displayed in the page banner, the RSS feeds, and various other places. Note that the PageHeader plugin defaults to only show the blog name. There is an option to show the description as well. The theme drop-down box allows you to select a theme for your blog. A theme is a set of templates, style sheets, images, and scripts that determine what your pages look like. Note that it is possible to customize your pages on a per-blog basis or to simply create your own theme, which can be either entirely original, or simply modifications to a few selected files. The themes use XHTML and CSS with a some inline PHP code to insert variables into templates and control display. Theming is a somewhat complicated topic, which I will, yet again, save for another day. The "maximum number of entries" box determines how many blog entries to show on the front page of the blog. Likewise, the "maximum number of entries in RSS feeds" determines how many entries to show at once in the RSS feeds. The "send Pingbacks when posting entries" box is used to enable or disable sending Pingback pings to pages your entries link to. By default, Pingback pings will be sent whether your entries accept Pingbacks pings or not. You can disable sending pings when you post your entry, but this sets the default. The "allow enclosure for entries" box simply turns on and off the text box for entering an enclosure URL for blog entries. Enclosures are the feature of RSS by which podcasting is made possible. If you don't do any podcasting, then you can uncheck this box to remove the extraneous box from the post editor. If the extra text box doesn't bother you, can can safely ignore this option. Lastly, the "default markup for entries and articles" box allows you to pick the default mode for writing your entries. You can override this on a per entry basis. The available choices are auto-markup (which is plain text with URLs made clickable), LBCode (which is a variant of BBCode), and raw HTML (no auto-generated code - not even line breaks). 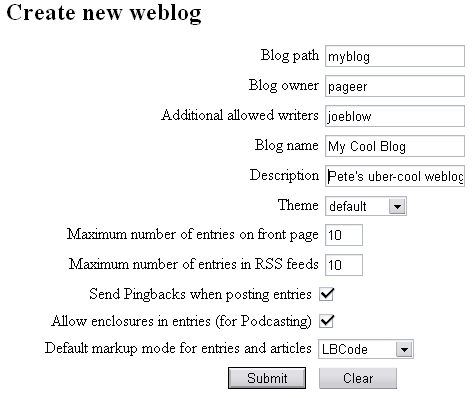 The default for new blogs is LBCode, as it is the easiest use, especially if you're familiar with web forums. You can read the LBCode documentation for the full list of supported tags. You should now be looking at a nice blog page with no entries on it. Next time, we'll briefly go over the how LnBlog handles user security and then we'll move on to filling in that empty blog. Enter the sum of 87 and 72.